I started to write “New DC Fast Charging Station” but caught myself. While the station at the Best Western Andersen’s Inn in Santa Nella, California is certainly new—it is, however, the only one for electric vehicles (EVs) other than Teslas! This is the first of—we hope—a series of DC Fast Charging stations to be installed this month under US Green Vehicle Council’s contract with the California Energy Commission. Note: This site has been removed from Plugshare at my request. The CEC contract called for a 25 kW station. We do not know if this station is more or less than 25 kW. If it is 25 kW or less, there is a question whether this station can be called "fast charge" or not. The first driver to use the station reported that it wouldn't charge his Kia Soul. For those outside California, the Santa Nella complex is a major stopover at a junction of on one of California’s two major north-south routes, Interstate 5, and a major east-west route, Highway 152. The area is also known to Californian’s as Los Banos, which is a nearby interchange. 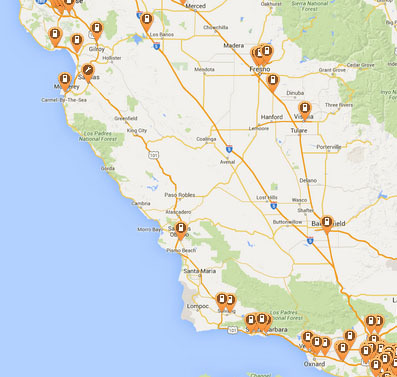 Outside Teslas’ Supercharger network, this is the first fast charger on the entire length of I-5 from the San Francisco Bay Area to the Los Angeles area. In contrast to the limited or non-existent fast charger network for mass-market EVs, Tesla has three Supercharger stations on this route—each with multiple bays. And Teslas have at least twice the range of mass-market EVs, such as the Nissan Leaf or BMW i3. The official explanation is that a decision was made to concentrate fast charging stations in the major metropolitan areas: San Francisco Bay, Los Angeles, and San Diego. However, this decision has severely limited the use of today’s mass-market EVs, making it prohibitively difficult to use EVs in intercity travel. In contrast to California, Oregon and Washington State built a network of fast charge stations along major—and even some minor—corridors. The long-awaited completion of the US Green Vehicle Council’s stations along the I-5 route is a first step toward alleviating the state’s absence of fast charge stations on a heavily travelled north-south corridor.